In the past year we have focused on the interaction of atoms with near-fields around optical nanofibers, quantum engineering of ultracold atom systems through shortcuts to adiabaticity, the developement of a model of heat-engine using changes in chemical potential, quantum walks in quasi-periodic systems, non-linear optomechanics and several other topics. We have investigated the chirality of light in the quasicircularly polarized fundamental and higher-order hybrid modes of vacuum-clad ultrathin optical fibers. For a given fiber with parameters in the range of experimental interest, the higher-order modes have smaller optical chirality per unit energy than the fundamental mode. The sign of the chirality per unit energy of a HE or EH mode is the same as or opposite to, respectively, the sign of the phase circulation direction. When the fiber radius is large enough, the field in a quasicircularly polarized hybrid mode can be superchiral outside the fiber. In particular, outside a fiber with a radius of 600 nm, the fields in the quasicircularly polarized HE11, HE21, and HE31 modes are superchiral. 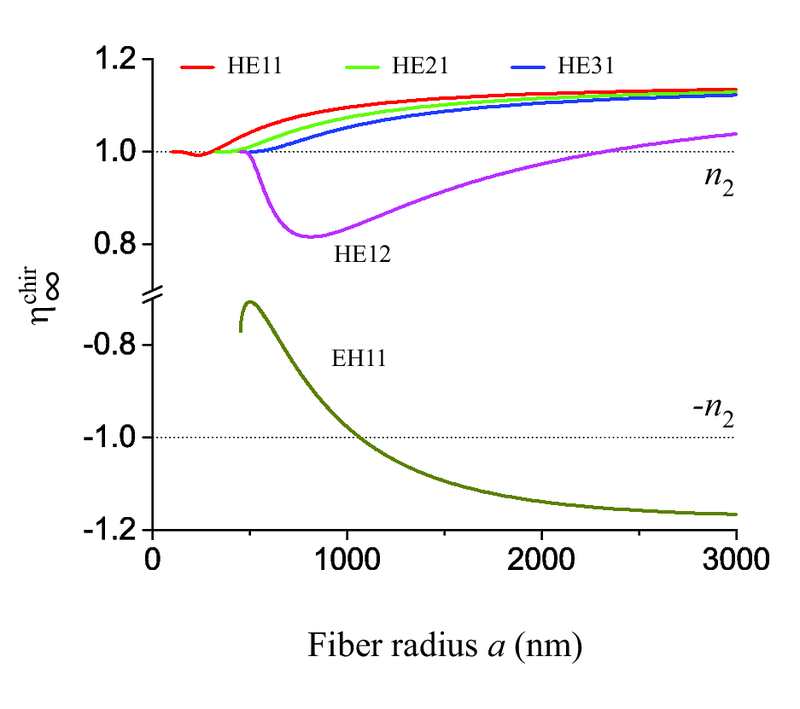 Figure: Dependence of the limiting value of the chirality factor at large distances on the fiber radius a for the counterclockwise quasicircularly polarized HE11, HE21, HE31, HE12, and EH11 modes. Fam Le Kien, Th. Busch, Viet Giang Truong, and S. Nic Chormaic, Commun. Phys. 27, 23 (2017). Together with the experimental group of Prof. Peter Engles at Washington State University we have explored the appearance of an effective negative effective mass in a spin-orbit coupled Bose-Einstein condensate by engineering the dispersion relation. The experimental group measured an expanding spin-orbit coupled Bose-Einstein condensate whose dispersion features a region of negative effective mass, and observed a range of dynamical phenomena, including the breaking of parity and of Galilean covariance, dynamical instabilities, and self-trapping. The experimental findings were reproduced by a single-band Gross-Pitaevskii simulation, demonstrating that the emerging features—shock waves, soliton trains, self-trapping, etc.—originate from a modified dispersion. This work has also shed new light on related phenomena in optical lattices, where the underlying periodic structure often complicates their interpretation. Figure: a) Schematic representation of the 1D expansion of a SOC BEC. The asymmetry of the dispersion relation (solid curve) causes an asymmetric expansion of the condensate due to the variation of the effective mass. The dashed lines indicate the effective mass, and the shaded area indicates the region of negative effective mass. The color gradient in the dispersion shows the spin polarization of the state. (b) Experimental TOF images of the effectively 1D expanding SOC BEC for expansion times of 0, 10, and 14 ms.
Phys. Rev. Lett. 118, 155301 (2017). We have investigated the role of different aperiodic sequences in the dynamics of single quantum particles in discrete space and time. For this have we consider three aperiodic sequences, namely, the Fibonacci, Thue-Morse, and Rudin-Shapiro sequences, whose diffraction spectra have pure point, singular continuous, and absolutely continuous support, respectively. Our interest was to understand how the order, intrinsically introduced by the deterministic rule used to generate the aperiodic sequences, is reflected in the dynamical properties of the quantum system. As the system we have considered a single particle undergoing a discrete-time quantum walk (DTQW), where the aperiodic sequences were used to distribute the coin operations at different lattice positions (inhomogeneous DTQW) or by applying the same coin operation at all lattice sites at a given time but choosing different coin operation at each time step according to the chosen aperiodic sequence (time dependent DTQW). We have studied the energy spectra and the spreading of an initially localized wave packet for different cases, finding that in the case of Fibonacci and Thue-Morse tilings the system is superdiffusive, whereas in the Rudin-Shapiro case it is strongly subdiffusive. Figure: Schematic of the arrangement of the two values for the periodic and the deterministic aperiodic sequences. We have presented a technique to control the spatial state of a small cloud of interacting particles at low temperatures with almost perfect fidelity using spatial adiabatic passage. To achieve this, we have suggested to engineer the resonant trap energies of the system in such a way that a single, well-defined eigenstate connects the initial and desired states and is isolated from the rest of the spectrum. As an example, this procedure was applied to the task of separating a small pre-defined number of particles (up to 10) from an initial cloud and and we have also shown that it can be implemented in radio-frequency traps using experimentally realistic parameters. Figure: Schematic of the three-level model for particle separation. Simultaneous lift of the right and the middle harmonic traps by Vlift=Uint makes the three states depicted resonant. Coherent quantum control over many-particle quantum systems requires high-fidelity dynamics. One way of achieving this is to use adiabatic schemes where the system follows an instantaneous eigenstate of the Hamiltonian over time scales that do not allow transitions to other states. This, however, makes control dynamics very slow. In this work we have introduced another concept that takes advantage of preventing unwanted transitions in fermionic systems by using Pauli blocking: excitations from a protected ground state to higher-lying states are avoided by adding a layer of buffer fermions, such that the protected fermions cannot make a transition to higher-lying excited states because these are already occupied. This allows to speed up adiabatic evolutions of the system. Together with the group of Andreas Ruschhaupt in at University College Cork in Ireland we have carried out a thorough investigation of the technique, and demonstrated its power by applying it to high-fidelity transport, trap expansion, and splitting in ultracold-atom systems in anharmonic traps. Close analysis of these processes has also led to insights into the structure of the orthogonality catastrophe phenomenon. Figure: (a) Schematic of the key idea: In order for the particles in the protected zone to remain in the lower-energy eigenstates during a time-dependent change of the external control parameters, a buffer zone is added. The Pauli principle then prevents the protected atoms from accessing any level in the buffer zone, and to access an unoccupied level above the Fermi edge requires a large amount of energy. (b) Fermi gap versus total particle number N for the anharmonic trap for different anharmonicities λ.
Cavity optomechanics has proven to be a field of research rich with possibilities for studying motional cooling, squeezing, quantum entanglement, and metrology in solid-state systems. While to date most studies have focused on the modulation of the cavity frequency by the moving element, the emergence of new materials will soon allow us to explore the influences of nonlinear optical effects. We have therefore studied the effects due to a nonlinear position-modulated self-Kerr interaction and found that this leads to an effective coupling that scales with the square of the photon number, meaning that significant effects appear even for very small nonlinearities. This strong effective coupling can lead to lower powers required for motional cooling and the appearance of multistability in certain regimes. We have investigated the dynamics of the rate function and of local observables after a quench in models which exhibit phase transitions between a superfluid and an insulator in their ground states. Zeros of the return probability, corresponding to singularities of the rate functions, have been suggested to indicate the emergence of dynamical criticality and we have addressed the question of whether such zeros can be tied to the dynamics of physically relevant observables and hence order parameters in the systems. For this we have first numerically analyze the dynamics of a hard-core boson gas in a one-dimensional waveguide when a quenched lattice potential is commensurate with the particle density. Such a system can undergo a pinning transition to an insulating state and we have found non-analytic behavior in the evolution of the rate function which is indicative of dynamical phase transitions. In addition, have we performed simulations of the time dependence of the momentum distribution and compared the periodicity of this collapse and revival cycle to that of the non-analyticities in the rate function: the two were found to be closely related only for deep quenches. By analytic calculations on a closely related discrete model of hard-core bosons in the presence of a staggered potential we were able to find expressions for the rate function for the quenches. By extraction of the zeros of the survival amplitude we uncovered a non-equilibrium timescale for the emergence of non-analyticities. We have studied the effects of repulsive on-site interactions on the broadening of the localized Wannier functions used for calculating the parameters to describe ultracold atoms in optical lattices. For this, we replaced the common single-particle Wannier functions, which do not contain any information about the interactions, by two-particle Wannier functions obtained from an exact solution which takes the interactions into account. We then used these interaction-dependent basis functions to calculate the Bose-Hubbard model parameters, showing that they are substantially different both at low and high lattice depths from the ones calculated using single-particle Wannier functions. Our results suggest that density effects are not negligible for many parameter ranges and need to be taken into account in metrology experiments. as for lattice depths (a) V0=10 Er and (b) V0=20 Er. The curves correspond to the different onsite and tunneling matrix elements. We have investigated a thermodynamic cycle using a Bose–Einstein condensate (BEC) with nonlinear interactions as the working medium. Exploiting Feshbach resonances to change the interaction strength of the BEC allows producing work by expanding and compressing the gas. To ensure a large power output from this engine these strokes must be performed on a short timescale, however such non-adiabatic strokes can create irreversible work which degrades the engine's efficiency. To combat this, we have designed a shortcut to adiabaticity which can achieve an adiabatic-like evolution within a finite time, therefore significantly reducing the out-of-equilibrium excitations in the BEC. Figure: Otto cycle: work is done during the compression WC and expansion strokes WE. Through coupling to an external reservoir the number of particles, N, can be increased or decreased, thereby dissipating particles QN- and absorbing particles QN+ and therefore increasing or decreasing the energy. Together with the group of Sile Nic Chormaic we have investigated the electric quadrupole interaction of an alkali-metal atom with guided light in the fundamental and higher-order modes of a vacuum-clad ultrathin optical fiber. We have calculated the quadrupole Rabi frequency, the quadrupole oscillator strength, and their enhancement factors. We have found that the root-mean-square (rms) quadrupole Rabi frequency reduces quickly but the quadrupole oscillator strength varies slowly with increasing radial distance. We have shown that the enhancement factors of the rms Rabi frequency and the oscillator strength do not depend on any characteristics of the internal atomic states except for the atomic transition frequency. The enhancement factor of the oscillator strength can be significant even when the atom is far away from the fiber. Fogarty, T. Shortcuts to adiabaticity in the Feshbach engine, in Frontiers of Quantum and Mesoscopic Thermodynamics, Prague, Czech Republic, 14 July (2017). Busch, T. Engineering of Quantum Systems by Controlling Interactions, in Coherent Quantum Dynamics 2017, OIST, Okinawa, 4 October (2017). Busch, T. Coherent Control of Atomic Few Body Systems, in Critical Stability of Quantum Few-Body Systems, Dresden, Germany 19 October (2017). Busch, T. Quantum dynamics in the presence of interactions, in Ultracold Atomic Gases and Quantum Control, Shanghai, China, 24 November (2017). Sachdeva, R. Artificial gauge fields for Bose Einstein Condensates in various geometries, in Ultracold Atomic Gases and Quantum Control, Shanghai University, Shanghai, China, 24 November (2017). Busch, T. Quantum state preparation in interacting quantum gases, in Fundamental Physics Using Atoms (FPUA), Nagoya, Japan, 9 January (2018). Busch, T. Controlling superfluid flow in Bose-Einstein condensates, in Recent Trends in Cold and Ultracold Matter, Guwahati, India, 27-29 March (2018). Sachdeva, R. Creating vortex rings in BECs in artificial magnetic field using optical nanofibers, Guwahati, India, 29 March (2018). Busch, T. Efficient Dynamics in a Feshbach Engine, in 4th Nottingham Workshop on Quantum Non-Equilibrium Dynamics, University of Nottingham, UK 26 April (2017). Edmonds, M. Engineering Bright Matter-Wave Solitons of Dipolar Condensates, in DAMOP 2017, Sacramento, CA, USA, 7 June (2017). Busch, T. Controlling superfluid flow in Bose-Einstein condensates, in Control of Quantum Dynamics of Atoms, Molecules and Ensembles by Light Workshop 2017, Nessebar, Bulgaria, 20 June (2017). Benseny C., A. Transport and particle separation in interacting quantum systems, in Mini Symposium: Small and Medium Sized Cold Atom Systems, Okinawa, Japan, 18 July (2017). Fogarty, T. Correlated non-equilibrium systems, in Mini Symposium: Small and Medium Sized Cold Atom Systems, Okinawa, Japan, 20 July (2017). Usui, A. Dynamical Phase Transition of a Tonks-Girardeau Gas, in Critical Stability of Quantum Few-Body Systems, Dresden, Germany, 8 October (2017). 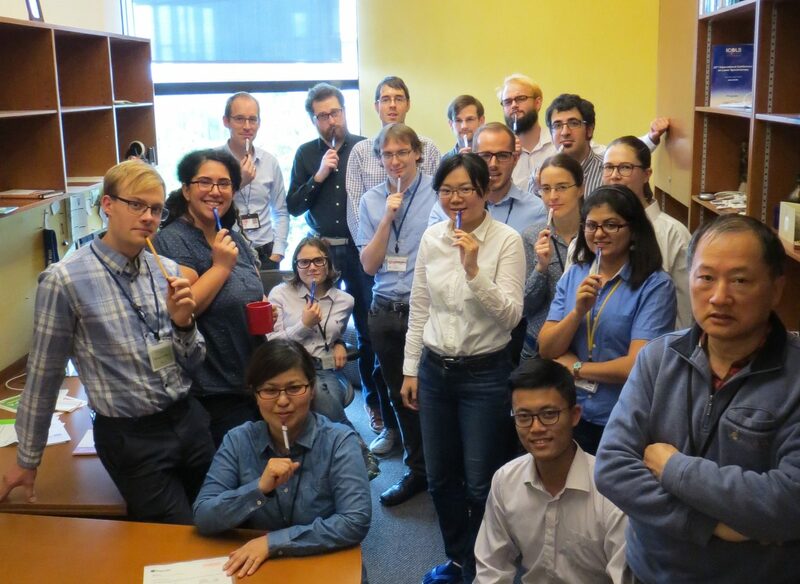 Benseny Cases, A., Kiely, A., Gillet, J., Zhang, Y., Ruschhaupt, A. & Busch, T. Quantum manipulation via spatial adiabatic passage, in Atomtronics 2017, Benasque, Spain, 8-19 May (2017). Fogarty, T., Li , j., Campbell, S., Chen, X. & Busch, T. Thermodynamics of interacting heat engines, in Gender Summit 10 – Satellite Conference in Okinawa, OIST, Japan, 29 May (2017). Benseny Cases, A., Kiely, A., Gillet, J., Zhang, Y., Ruschhaupt, A. & Busch, T. Quantum manipulation via spatial adiabatic passage, in Gender Summit 10 – Satellite Conference in Okinawa, OIST, Japan, 29 May (2017). Edmonds, M., Bland, T., Doran, R. & Parker, N. Engineering bright matter-wave solitons of dipolar condensates, in Gender Summit 10 – Satellite Conference in Okinawa, OIST, Japan, 29 May (2017). S. Hejazi, S. S., White, A. & Busch, T. Quantum walk and 2D phase, in Gender Summit 10 – Satellite Conference in Okinawa, OIST, Japan, 29 May (2017). Sachdeva, R., Schloss, J. & Busch, T. Creating superfluid rings in artificial magnetic fields, in Gender Summit 10 – Satellite Conference in Okinawa, OIST, Japan, 29 May (2017). Fogarty, T., Usui, A., Silva, A., Goold, J. & Busch, T. Dynamical Phase Transitions in 1D Quantum Gases, in Non-equilibrium Quantum Matter, SPIN Phenomena International Center, Mainz University, Germany, 31 May (2017). Edmonds, M. B., Thomas. Transport properties of Bright Matter-Wave Dipolar Solitons in a Tonks-Girardeau gas, in DAMOP 2017, Sacramento, CA, USA, 6 June (2017). Edmonds, M., Bland, T. & Parker, N. Non-local dark solitons in dipolar condensates, in DAMOP 2017, Sacramento, CA, USA, 7June (2017). Mikkelsen, M., Fogarty, T. & Busch, T. Tonks-Girardeau gas in a driven optical lattice, in Emergent Phenomena and Universality in Correlated Quantum Systems Far Away from Equilibrium, Physikzentrum, Bad Honnef, Germany, 20 June (2017). Sachdeva, R., Schloss, J. & Busch, T. Creating superfluid vortex rings in artificial magnetic fields, in International Conference on Laser Spectroscopy (ICOLS 2017), Arcachon, France, 3 July (2017). Fogarty, T., Usui, A., Busch, T., Silva, A. & Goold, J. Dynamical phase transitions in the Tonks-Girardeau gas, in Frontiers of Quantum and Mesoscopic Thermodynamics, Prague, Czech Republic, 13July (2017). Sachdeva, R., Schloss, S., and Busch, T. Creating and controlling superfluid vortex rings in artificial magnetic fields, in Bose-Einstein Condensation 2017 Frontiers in Quantum Gases, Sant Feliu de Guixols, Spain, 7 September (2017). White, A., Zhang, Y. & Busch, T. Necklace-like states in toroidally trapped Rashba spin-orbit coupled Bose-Einstein condensates, in Bose-Einstein Condensation 2017 Frontiers in Quantum Gases, Sant Feliu de Guixols, Spain, 7 September (2017). Li, J., Fogarty, T., Campbell, S., Chen, X. & Busch, T. Shortcuts to adiabaticity in the Feshbach engine, in Quantum Thermodynamics: Thermalization and Fluctuations, Kyoto, Japan, 28 September (2017). White, A., Zhang, Y., Hennessy, T. & Busch, T. Multi-component Bose-Einstein condensates in toroidally trapped geometries, in Coherent Quantum Dynamics 2017, Okinawa, Japan, 28 Septermber (2017). Edmonds, M. & Busch, T. Transport properties of Bright Matter-Wave Solitons in a Tonks-Girardeau gas, in Coherent Quantum Dynamics 2017, Okinawa, Japan, 28-29 Septermber (2017). Mikkelsen, M., Fogarty, T. & Busch, T. Tonks-Girardeau gas in a driven optical lattice, in Coherent Quantum Dynamics 2017, Okinawa, Japan, 29 Septermber (2017). Sachdeva, R., Schloss, J. & Busch, T. Creating superfluid vortex rings in artificial magnetic fields, in Coherent Quantum Dynamics 2017, Okinawa, Japan, 29 Septermber (2017). Sachdeva, R., Singh, M. & Busch, T. Extended Bose Hubbard model for two leg ladder in artificial magnetic fields, in Coherent Quantum Dynamics 2017, Okinawa, Japan, 29 Septermber (2017). S. Hejazi, S. S., Sachdeva, R., Le Kien, F. & Busch, T. Enhancement of cooperativity between atoms in front of a flat dielectric surface, in The 2nd Photonics Meeting "Explore the limit of light! ", Naha, Okinawa, 1 December (2017). Edmonds, M. & Busch, T. Transport Properties of Bright Matter-Wave Solitons in a Tonks-Girardeau gas, in FINESS 2018, Wanaka, New Zealand, 21 February (2018). Fogarty, T., Usui, A., Busch, T., Silva, A. & Goold, J. Dynamical phase transitions and temporal orthogonality in one-dimensional hard-core bosons: from the continuum to the lattice, in ITAMP/B2 Winter School, Tucson, Arizona, USA, 21-22 February (2018). S. Hejazi, S. S., Le Kien, F., Busch, T., Giang Truong, V. & Nic Chormaic, S. Chiral force of guided light, in Quantum Optics 2018, Obergurgl, Tirol, Austria, 2-3 March (2018). Mikkelsen, M., Fogarty, T. & Busch, T. Phases of the Tonks-Girardeau gas in a continuous optical lattice: Statics and Driven Dynamics, in Quantum Many-Body Systems Far From Equilibrium: Quench Dynamics, thermalization, and many-body localisation, Stellenbosch, South Africa, 18 March (2018). Busch, T. Superfluid Flow, Solid Body Rotation and Necklace States in BECs in Annular, at Durham University, UK, 26 April (2017). Busch, T. Trapping and controlling ultracold atoms with optical nanofibres, at Max Plank Institute for Light, Erlangen, Germany, 6 May (2017). Fam, L. K. Higher-order modes of vacuum-clad ultrathin optical fibers, at the University of Electro-Communications, Japan, 22 May (2017). Benseny Cases, A. Spatial adiabatic passage: interactions, particle separation, and shortcuts, at Universitat Autònoma de Barcelona, Spain, 25 May (2017). Busch, T. Engineering of Quantum Systems by Controlling Interactions, at Lund University, Sweden, 11 September (2017). White, A. Multi-component condensates in toroidally trapped geometries, at Universitat Autònoma de Barcelona, Spain, 12 September (2017). Benseny C., A. Transport and particle manipulation in interacting quantum systems, at Heidelberg University, Germany, 27 September (2017). White, A. Multicomponent condensates in toroidally trapped geometries, at Shanghai University, China, 30 November (2017). Busch, T. Quantum dynamics in the presence of interactions, at Center for Optical Quantum Technologies, Hamburg University, Hamburg, Germany, 6 February (2018). Busch, T. Quantum dynamics in the presence of interactions, at CNRS, Laboratoire de Physique et Modélisation des Milieux Condensés, Grenoble, France, 14 February (2018). Sachdeva, R. Bose-Einstein condensates with long range interactions in optical lattices, at Indian Institute of Technology Indore, India, 23 March (2018).